University of Alberta, 1983, B.A.Sc. 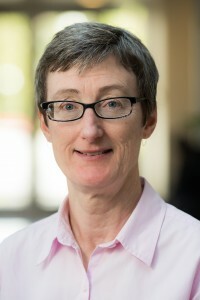 Dr. Creagh research interests include thermodynamics and kinetics (calorimetry, analytical ultracentrifugation, surface plasmon resonance) of protein stability and protein-ligand binding. B. Lai, A.L. Creagh, J. Janzen, C.A. Haynes, D.E. Brooks, J. Kizhakkedathu, “The induction of thrombus generation on nanostructured neutral polymer brush surfaces”, Biomaterials 31 6710-6718 (2010). J. Kizhakkedathu, A.L. Creagh, R.A. Shenoi, N.A.A. Rossi, D.E. Brooks, T. Chan, J. Lam, S.R. Dendappally, C.A. Haynes, “High molecular weight polygycerol-based multivalent mannose conjugates”, Biomacromolecules, 11 (10) 2567-2575 (2010). M. Foldvari, I. Badea, S. Wettig, D. Baboolal, P, Kumar, A. L. Creagh, C. A. Haynes, “Topical delivery of interferon alpha by biphasic vesicles: evidence for a novel nanopathway across the stratum corneum”, Mol. Pharmaceutics, 7 (3) 751-762 (2010). M. Kavoosi, A.L. Creagh, R.F.B. Turner, D.G. Kilburn, C.A. Haynes, “Direct measurement of the kinetics of CBM9 fusion-tag bioprocessing using luminescence resonance energy transfer”, Biotech. Prog. 25 (3) 874-881 (2009). A.-K. Bordbar, A.L. Creagh, F. Mohammadi, C.A. Haynes, C. Orvig, “Calorimetric studies of the interaction between the insulin-enhancing drug candidate bis(maltolato)oxovanadium(IV) (BMOV) and human serum apo-transferrin”, J. Inorg. Biochem., 103 643-647 (2009). M.S. Wilke, M. Heller, A. L. Creagh, C. A. Haynes, L. P. McIntosh, K. Poole, N.C.J. Strynadka, “The crystal structure of MexR from Pseudomonas aeruginosa in complex with its anti-repressor ArmR”, Proc. Natl. Acad. Sci. USA, 105 (39) 14832-14837 (2008). M. Okon, T. Moraes, P. I. Lario, A. L. Creagh, C. A. Haynes, N. C. J. Strynadka and L. P. McIntosh, “Structural characterization of the type III pilot-secretin complex from Shigella flexneri”, Structure 16 (10) 1544-1554 (2008). C. Thomson, S. Bryson, G. McLean, L. Creagh, E. Pai, J. Schrader, “Germline V-genes sculpt the binding site of a family of antibodies neutralizing human cytomegalovirus”, EMBO J. 27 (19) 2592-2602 (2008). M. Kavoosi, A.L. Creagh, D.G. Kilburn, C.A. Haynes, “Strategy for selecting and characterizing linker peptides for CBM9-tagged fusion proteins expressed in E. coli”, Biotechnol Bioeng., 98 (3) 599-610 (2007). A. Jirasek, H.G. Schulze, C.H. Hughesman, A.L. Creagh, C.A. Haynes, M.W. Blades, R.F.B. Turner, “Discrimination between UV radiation-induced and thermally induced spectral changes in AT-paired DNA oligomers using UV resonance Raman spectroscopy”, J. Raman Spectroscopy 37 (12) 1368-1380 (2006).